At last the earth thinks its SPRING! Just look at that for power and strength and the lusty life-force of Spring! Wonderful! There may still be frosts to come but officially Winter must be past. We (with a visiting friend) certainly celebrated today by having our lunch outside in the sun. 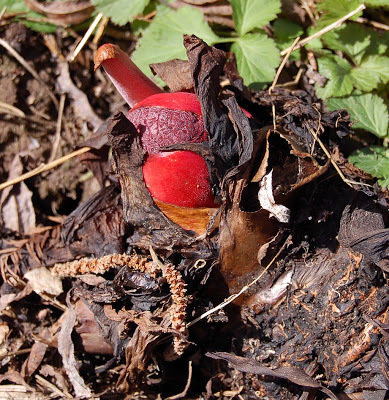 This amazing plant (a dramatic, if inedible, relative of Rhubarb . . . whose name I sadly cannot remember) is spreading sideways in a very impressive way as well as indulging in its main trick of growing upwards, very far and very fast. In almost no time at all there will be flower stalks and leaves about six feet high! The Mullein below will also grow gloriously tall but that is not quite why I am mentioning it here. The fact is that it has just turned up . . . in a pot just in front of our house . . . a pot otherwise containing something dead but not yet dug up. I know that not everyone is as fortunate as we are to have a garden for things to turn up in but, in these days of downturn, credit crunch and having to do without this and that, it seems to me that we are rich indeed to have been presented with something as wonderfully beautiful in its architecture and as sensuous in its feel as this glorious plant. And here, finally, is a more general view in the domain . 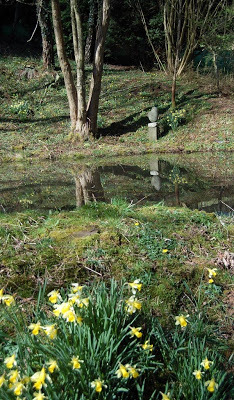 . . with some Welsh daffodils! Ahhh yes, the beautiful, velvety mullein. You can bet that’s been ‘gifted’ by a bird. The great thing about mulleins if you like them… and you and I do though some gardeners do not… is that once they’re in, they’re IN. 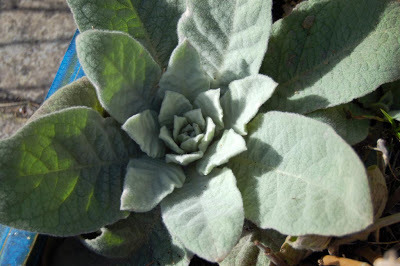 As with borage, mullein is the guest that never leaves! I’ve been counting mulleins here at Ty Isaf, and this year we have six or seven in various parts. They’re very well behaved guests though, and have sensibly bedded themselves at the backs of wide herbaceous borders, where their stately height will be most appreciated. And the rabbits hate them, so no fear of cropping. Speaking as one whose entire population of ornamental onion has just been eaten to the ground, anything the wretches turn aside from is a blessing indeed. Of course Nature gardens better than we do. The rabbits are indifferent to the plants she bestows on us. 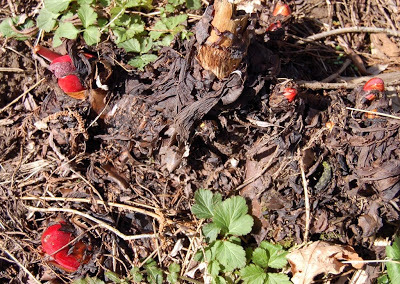 Foxgloves, primroses, mulleins… all sleep unmolested in their beds! We should take the hint and garden as she does.